When the calendar turns to May, the Cape Cod events schedule heats up ... just like our weather! Events throughout the month of May have us all outdoors, enjoying the spring sunshine and the first balmy beach days of the season. From the annual Cape Cod Maritime Days celebration to lighthouse tours, art gallery openings and the world-famous Figawi Regatta on Memorial Day weekend, there's a lot of fun stuff to see and do on Cape Cod in May! The annual Maritime Days festival heralds summer by the sea with a month-long celebration dedicated to our rich seafaring heritage. During Maritime Days on Cape Cod, events and special activities take place in nearly every town. Some highlights include harbor cruises, guided kayak tours, special museum and gallery exhibitions, a Maritime History Symposium, and much more. The annual Brewster in Bloom Festival is a weekend-long extravaganza that includes an antiques and art excursion, a band concert, a 5K run, kids' events, sidewalk sales, free hayrides, arts & crafts shows, a music festival, all topped off with the Brewster in Bloom Parade on Sunday afternoon. Visit the beautiful "Sea Captains Town" of Brewster and join in on the celebration! At Highland Light, the oldest working lighthouse on the east coast, a winding staircase leads from the base to the lantern room. The view from the top is spectacular! For anyone who's not able (or inclined) to climb the stairs, there's an interesting little museum and memorabilia area at the base that's well worth seeing. Note: Click here to see more lighthouses that are open for tours. These adorable "shanties" house artists and artisans whose works include ceramics, painting, jewelry and more. Items are for sale at very reasonable prices (IMHO). And even if you're not in shopping mode, it's a pleasure peeking at the artists' creations as you stroll along the harborfront. The shanties are open on weekends only from opening day in early May until mid-June, then every day through late September. This farmers market is filled to the brim with farm fare vendors. Just a few of their offerings: seasonal veggies and fruits; grass-fed beef, pork and lamb; free range chickens and turkeys; farm-fresh eggs; jams and jellies; baked goods; ginger beer and wine; flowers, herbs and herbal products; and local artists' works. This three day event features an extensive plant sale of herbs, perennials, wildflowers, everlasting and annuals at great prices. There'll also be guided walks through the award winning wildflower garden. Be sure to check out Green Briar's unique gift shop! It's filled with a variety of gardening items and books, along with a great selection of jams, jellies, and preserves made right there in the historic Jam Kitchen. The annual "Figawi" Regatta is recognized as one of the premier yacht regattas on the east coast. 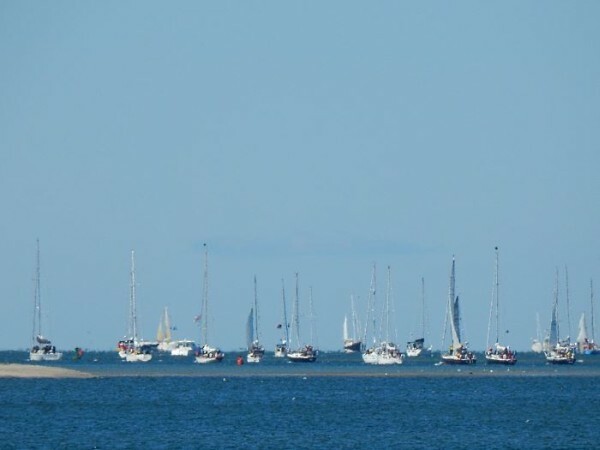 On Saturday morning, the large, colorful fleet gathers just outside Hyannis' inner harbor, waiting for the 10 a.m. start signal to begin their race to Nantucket.